A small thin waterbed mattress inside a tent cot that is filled with water that's heated by the sun during the day and cooled at night. The idea is that the sun will heat the water in the coil of copper tubing, and by the thermosiphon effect, heat the water in the bucket. During the day, the water in the water mattress will be cold, providing a (hopefully) nice place to lie down, even in the summer. 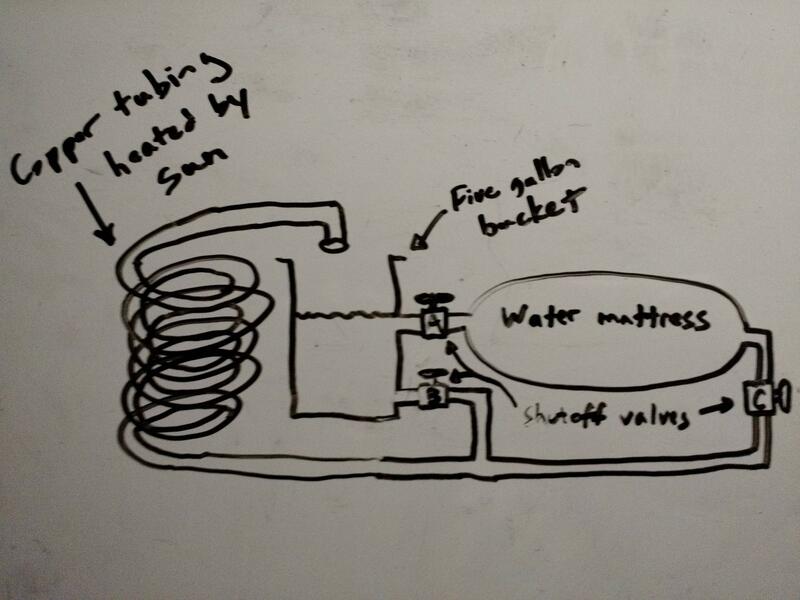 Valves A and C will be closed to prevent my body weight from pushing the water out of the mattress, and valve B will be open to keep the water flowing into the coil of copper tubing. Now, the mattress is filled with warm water which will (hopefully) keep me warm at night. Meanwhile, the water in the bucket is still outside the tent and cooling in the night air, ready to be put into the mattress when it gets hot during the day. I'm not sure how to do this part, but perhaps with valves A and C closed, the bucket could be lifted above the height of the mattress. Then, assuming the mattress can accommodate the extra volume of water, the water in the bucket will drain into it. Then valve B is closed, and the bucket is set down. Valve A is then opened, and the bucket will fill with water from the other side of the mattress. The water mattress is 32" x 68" x 4". This comes to 8704 cubic inches if it were a perfect rectangular box, which is 37.7 gallons. I think 25 gallons might be a reasonable guess as to actual volume of the mattress. Assuming 8.3 lbs per gallon, this comes to 208 lbs. The cot is rated for 500 lbs, so it should be strong enough. Is the design sound? Is there a better way? Is a five gallon bucket of water enough? How can I estimate how much the sun will heat the water and the temperatures that can be maintained inside the tent? How much and what diameter of copper tubing should I use? Ideally, I'd build a solar water-heating panel but portability is a concern, as is cost and labor. I'm disabled with CFS, so I have very little money and energy (for building this, assembling it, and carrying things). I'm thinking I could make a solar cooker out of foam core and plexiglass, which, in addition to cooking food in, could also be sized to allow the coil of copper tubing to be placed inside. Never leave home without an air mattress. I've been observing the fools that sleep on the ground for years. The older you get the more likely you will do serious damage. Yes, the "macho" who sleeps on the ground, but only goes camping a few days a year because it's too cold. Unfortunately there comes a time in the fall where an air mattress also gets cold. In answer to your question, the problem you will have with sleeping on a giant hot water bottle is too much heat. I have done something similar for cabin bunks. 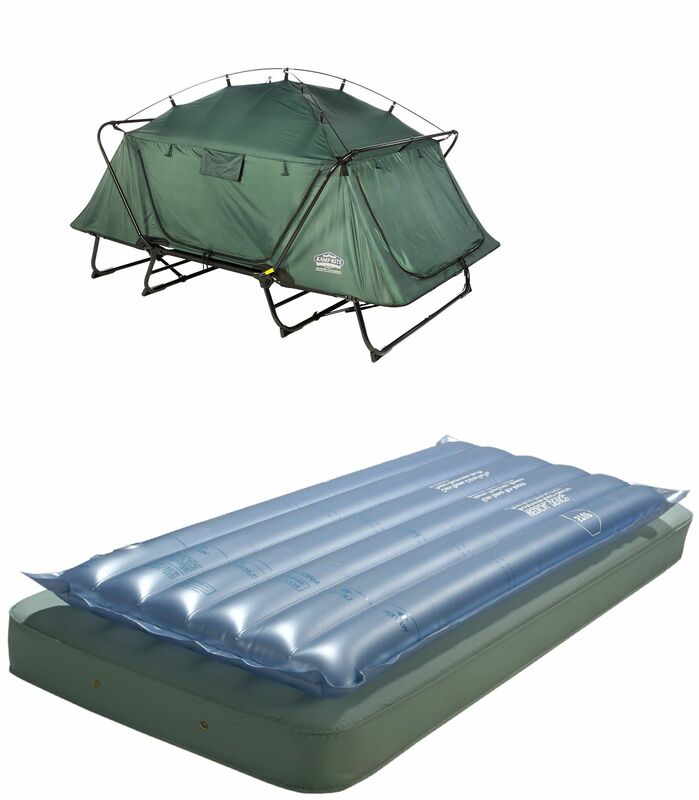 You are better off with the light-weight air mattress and an air space between you and the "hot water bottle". The thermal conductivity of the water bottle is critical to slow down the transmittance of the stored heat. PVC water bladders are good. It does not need to be that big 10 gallons that will last the night (at 100 F you have 2,500 BTU's above ambient). Since you are getting all high- techy, don't forget to drape a radiant barrier (space blanket on top of you). This will cut your BTU requirement in half! It depends on overnight temperatures, but I have heard people brag about their 2 gallon water bottle and space blanket. I have 10 gallon poly under the bunks. A simple thought. A black or dark green water bladder 3 gallons would be 25 lbs. a glazed (something clear like polycarbonate) enclosure to hold said bladder and sit in sun. About a 600 to 800 btu's/sq.ft. on a sunny day. You need to be aware of overheating. 3 sq.ft. could easily be over 2000 BTU's, and that's over 150 F for 3 gallons of water. On a cloudy day, surprisingly, you still get half that. So invent a roll-up/fold-up green house, to go with the fold-up water bladder. Better Google that though before you waste too much time. Not the answer you're looking for? Browse other questions tagged water heating cooling solar-thermal or ask your own question. What software should I use to design and simulate a solar-assisted cooling system? How does one utilize the low pressure of a rain barrel? Does a solar thermal hot water system make sense for my home?